In I Don’t Know What I Want . . . But I Know It’s Not This, career consultant Julie Jansen won over readers with the same comforting, clear headed approach that she brings to her many Fortune 500 clients. Now she tackles a problem that affects every working person, regardless of occupation: difficult people. 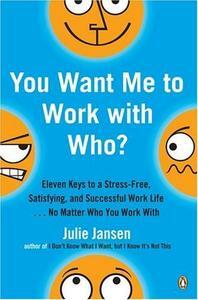 Whether the problem is an “abusive” boss, “toxic” coworker, or “difficult” assistant, Jansen shows how to master the eleven keys to getting along with even the most dysfunctional colleagues. Featuring self-assessment exercises designed to identify the root causes of problem behavior and smart, viable solutions and tips for managing different kinds of difficult people—from subordinates to superiors—this invaluable resource is a savvy, humane guide to reducing stress, establishing workplace harmony, and making sure that no one stands in the way of your career goals. In I Don’t Know What I Want . . . But I Know It’s Not This, career consultant Julie Jansen won over readers with the same comforting, clear headed approach that she brings to her many Fortune 500 clients. Now she tackles a problem that affects every working person, regardless of occupation: difficult people. 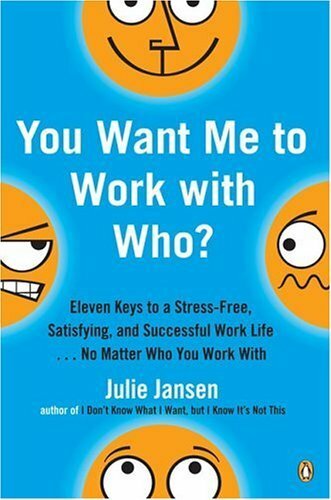 Whether the problem is an “abusive” boss, “toxic” coworker, or “difficult” assistant, Jansen shows how to master the eleven keys to getting along with even the most dysfunctional colleagues. Featuring self-assessment exercises designed to identify the root causes of problem behavior and smart, viable solutions and tips for managing different kinds of difficult people-from subordinates to superiors-this invaluable resource is a savvy, humane guide to reducing stress, establishing workplace harmony, and making sure that no one stands in the way of your career goals.